I had the pleasure of attending my first Association of Researchers in Construction Management Conference (ARCOM) this week. The conference brings together academics and practitioners to develop, promote and discuss research topics around the construction industry sector. Although it was the 32nd annual conference, it was the first year that a theme had been adopted. The construction worker and how work and the worker are evolving amidst a social technological change was the topic in question. 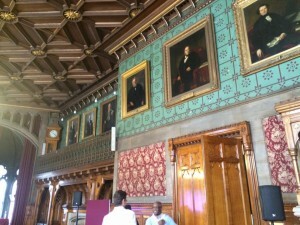 The conference was held in the beautifully gothic Manchester town hall. It was a delight to present, listen, deliberate and make new friends and connections in such a beautiful and historical place. The most striking thing about the conference was how friendly the conference was, whilst there were clearly regular attenders to the conference, as a newbie ARCOM goer I was made to feel like a regular by both new and returning delegates. The conference was held over 3 days with a good range of talks including discussions on research methods, socially constructed notions of the construction worker, governance, standards, technologies, health and safety, resilience, emergency and disaster planning amongst many others. Here’s a couple of the highlights from the few but interesting sessions I managed to attend. Ruth Dowsett discussed the findings from 2 case studies of projects implementing Building Information Modelling (BIM). The research highlighted the need for a more comprehensive approach to capturing the benefits of BIM to usefully inform the development of BIM implementation strategies. 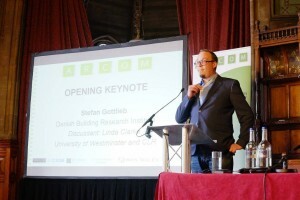 Stefan Gottlieb provided the first keynote presentation which discussed the application of Foucault’s concept of governmentality in a dual analysis of the formation and transformation of the construction sector and the construction worker. Stefan argued that the construction sector was first rendered governable in the 1940s to achieve national modernisation. Stefan’s work focuses on the Danish construction industry and he provided a timeline of the industry for that context. The change in identity of the construction worker from an economic resource to develop innovation to an entity that was responsible for the development of the sector was discussed. On the second day I had a chance to present the work myself and Barry Gledson had done on the status, scale and suitability of BIM education and training pre government level 2 BIM mandate. The study represented the findings of a survey of 50 construction practitioners. The results highlighted that approximately half the respondents had received some form of education and training. Although there were higher levels of BIM awareness, use and understanding. The majority of the education and training received was self-sourced, but those that had not received any education or training expected their employer to provide it. It is clear from the results that for organisations to respond to the BIM level 2 mandate with confidence further training and education is required. Barbara Vohmann looked at the employability of construction management students. In particular the study focused on whether assessment feedback provides students with information required to develop employability skills. Results showed that feedback was not enabling students to develop their employability skills in the construction management sector. John Smallwood looked at using pre and post module evaluations to manage student satisfaction of modules. The findings showed that doing a preparatory lecture with students to explain how a module relates to other modules on a course contributes to managing student expectations and improving student satisfaction. Keynote Dylan Tutt discussed the use of ethnography to study the concept of masculinity amongst migrant construction workers. Tutt’s work explored the continuity of relationships of migrant workers between the onsite and offsite worlds of the workers. The research showed that whilst workers create an intimate community of support and trust for the duration of the project, often the relationships come to and end when the project ends. What are the broader implications post brexit for the worker. How will working practices change in response to regulation changes. Will Relations between national and global markets change and how can we cope with the relationship and rethink our approach. Britain has relied on poaching trained workers from other countries that are much better trained than the in the UK. Will they have access to these workers post brexit? Brexit will have a serious effect on unions due to the lack of opportunity to work with unions across Europe. There may be an opportunity to unite with us but this is anlong way away. There were concerns about detangling and reimagining regulation frameworks. Does brexit offer opportunities to other eu countries. Migration opportunities, labour market came to uk but will now go elsewhere. It was highlighted that export issues regarding beer and bacon would be a problem for Denmark, but not construction materials, maybe the UK needs to look at new exporting revenues. One issue highlighted was the danger in racism on construction sites, danger across Europe that this will be a challenge. After the post brexit discussions it was back to some more paper presentations. Having spent a lot of time studying BIM data, standards, semantics, relationships etc it was great for me to engage with Shouke Beemsterboer on his research. 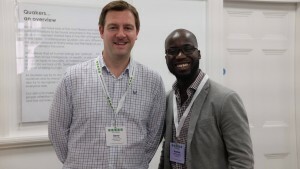 He presented the work he is doing on developing information standards to enable data sharing across big data technologies. Whilst no solutions were found we all agreed that trying to standardised an industry that basis the majority of its work around custom and practice is an almighty challenge which may well require a different approach to tackling the data interoperability issue. Watch this space. There was a whole session dedicated to ranting, where anyone can volunteer t have a 3 minute rant about anything. There were rants ranging from a lack of useful research being performed, to rants about rubbish journal articles, people ranting about their own careers, random rants about nothing in particular, to rants about the lack of images of women in the building. 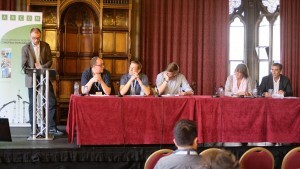 I was a bit apprehensive about attending the session but I’d recommend it for a bit of light hearted conference relief. After all that ranting there was an opportunity to meet the editors from the construction journals published by Emerald. The session was a really useful opportunity to ask questions relating to getting published. Some real sound advice was given on sending an abstract in to see if it was the right fit for the journal before submitting the full paper. Further guidance was provided on how to handle contrasting reviews, authors were advised to decide which way they wanted their paper to steer and to be wary of writing the paper the reviewer would want you to write rather writing the paper you want to write. The last day was a short session which was well attended, despite the celebrations at the conference dinner on the Tuesday. Barry Gledson’s paper on exploring the consequences of 4D BIM innovation adoption was well received. Barry looked at the desirable/undesirable, direct/indirect and anticipated/unanticipated consequences of past innovation. The findings of which demonstrated that not all innovation is beneficial to all communities. Barry then discussed the repsonses from qualitative discussions with practitioners on the perceptions of 4D BIM innovation adoption. The findings revealed practitioner concerns over the additional work required to create 4D plans and the quality of plans produced. My fellow NORSC colleagues will be pleased to hear that the next ARCOM conference is themed around a subject that is popular within the group BRUTALISM IN CONSTRUCTION. I will be speaking to willing collaborators on potential papers around this subject for next year.